First, I just love brownies. I have tons of different brownie recipes on my site too. I’m thinking of sharing my favorite “brownie in a mug” recipe soon. Anyone interested? It’s our go-to treat when my husband and I want something sweet, fast, that doesn’t make a mess. Brownies are the best. Top them with marshmallows and the best creamy homemade chocolate frosting and I’m pretty much in heaven. Second, my Mississippi Mud Cake recipe totally went viral on facebook–it’s had over 9 MILLION views. Say whhhaa?! 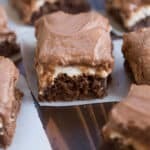 Obviously you all love the chocolate/marshmallow combo as much as I do, so it’s high time I shared these insanely delicious Mississippi Mud Brownies! These little beauties are really simple. They start with a super easy, one-bowl brownie recipe. That’s right–mix all the ingredients in just one bowl. 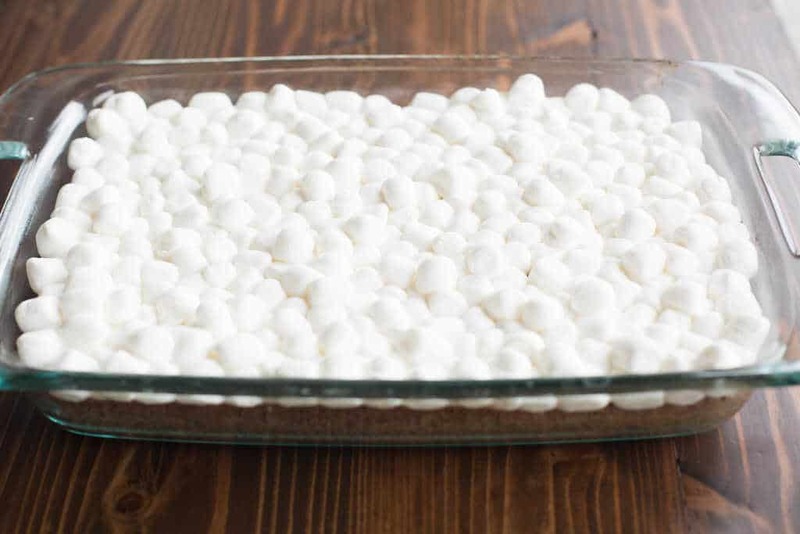 Once they’re cooked you scatter mini marshamllows all over the top of the warm brownies and pop them back in the oven for a minute or two. The marshmallows will gently puff. Next, you let them cool. You want them all the way cool so that the frosting is easier to spread. Once they’re cool, make the frosting. My mom taught me the trick to add evaporated milk to frosting. I always have some on hand because you can store it in your pantry. It adds an awesome, creamy flavor. You could also substitute half and half, or milk if you’re desperate, but it wont be quite as creamy and delicious. Spread the frosting all over! I’m a frosting kind of gal, so I like to add it all, but if you don’t want to use the entire batch of frosting you can store it in an airtight container in your fridge for a few weeks or even freeze it for later. Cutting these bad boys can be a sticky situation, but I’ve found that a plastic knife works best. Just use good pressure as you cut down and wipe the knife clean with each cut. I almost like these brownies even better on day 2. Something about the way the flavors blend together and settle after several hours makes them even more irresistible. I also feel like they’re a little less “rich” on day two, and they are easier to cut. But, it may be hard to wait that long, so feel free to dig in right away. If you don’t want to use the entire batch of frosting you can store any extra in a tupperware in your fridge for several weeks, or you can freeze it. Preheat oven to 350 degrees F. Grease a 9x13'' pan with non-stick cooking spray. In a large mixing bowl, pour oil over cocoa powder and mix. Add softened butter and mix until smooth. Add sugar and mix for 1 minute. Add eggs, one at a time, mixing after each addition. Add vanilla and mix. Add flour and salt and stir to combine. Add melted butter, cocoa powdered, evaporated milk, vanilla, and 2 cups of powdered sugar to a mixing bowl and beat with electric beaters until smooth. Add more powdered sugar, a cup at a time, mixing well, until you reach your desired frosting consistency. I usually use about 3 1/4 cups powdered sugar. 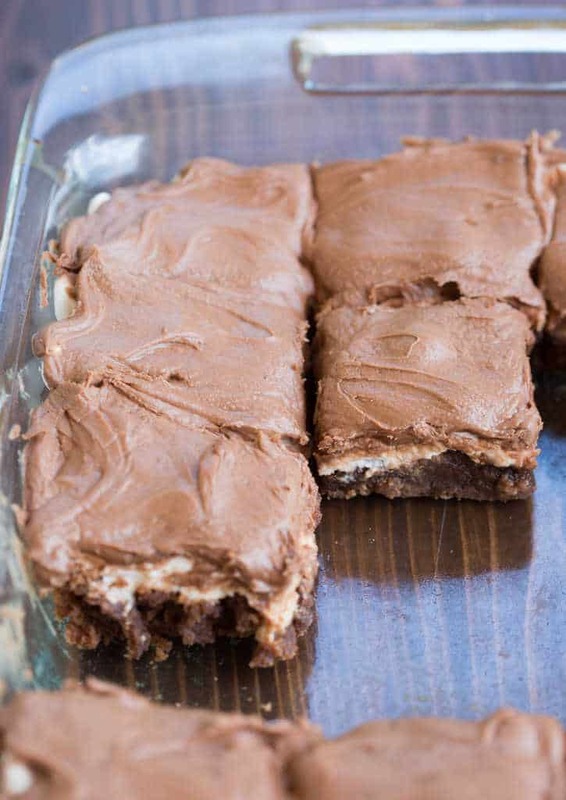 Spread frosting over the cooled brownies and cut into squares. I've found a plastic knife works best to cut them, or if you make them 1 day in advance they are much easier to cut. 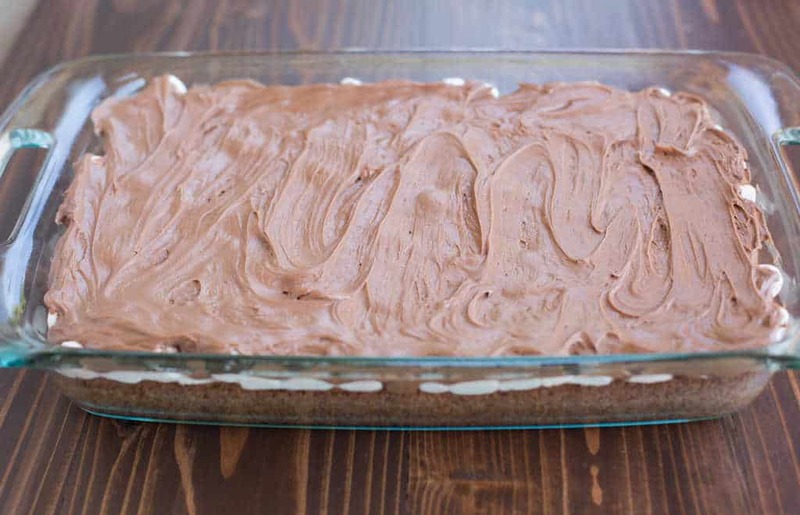 Have you tried Mississippi Mud Cake? 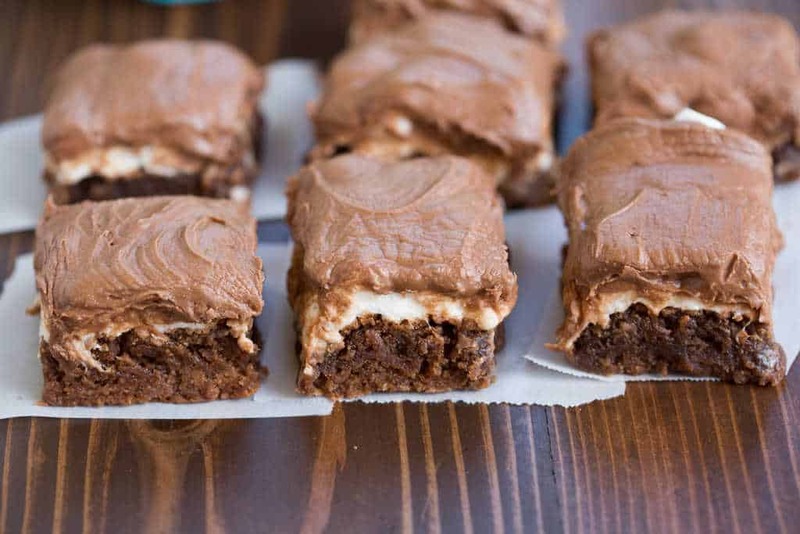 Don't miss my tips for making and storing these brownies in the post above. HAVE YOU TRIED THIS RECIPE?! RATE AND COMMENT BELOW–I WOULD LOVE TO HEAR YOUR EXPERIENCE. My brownies came out very cakey and dry. I must have over-baked them but the toothpick didn’t come out clean until after 30 minutes. The frosting is amazing!!!! What could be the reason for a few cracks on top of Mississipi mudcake The recipe cant be more fabouless Super!!! 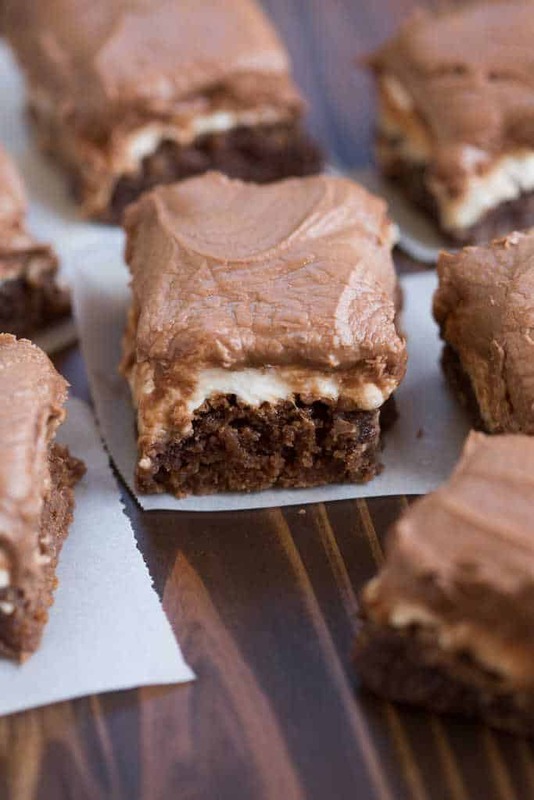 These Mississippi Mud Brownie is worth the effort. The only critique I have to offer is to avoid over-baking. To other bakers out there, keep checking the brownie throughout the process in the oven. Also, I added caramel to the icing/glaze which adds extra flavor. 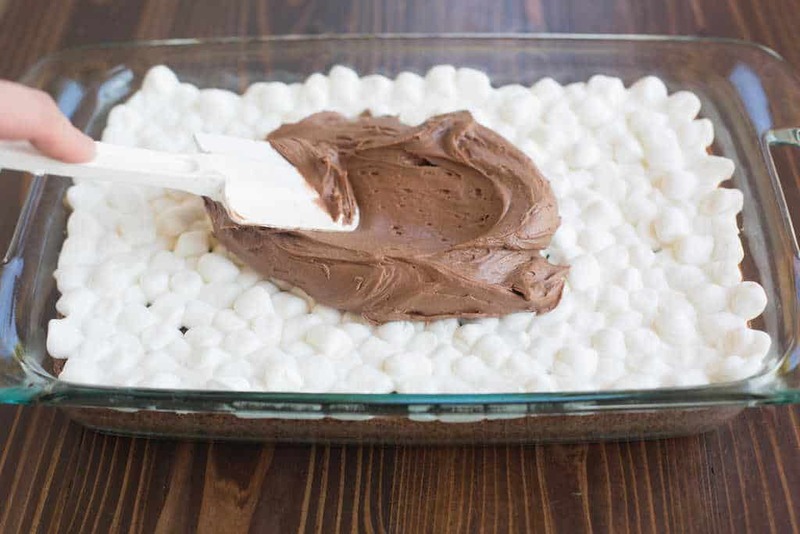 I’m all about trying new ingredients, so I suggest adding a little chocolate with the marshmallows. This is worth the effort!